While do it yourself projects may seem like a cheaper way to go about home renovations, often times, homeowners find they’re not. Flooring is an expensive investment. Protecting that investment by choosing professional floor removal services could save you a headache and a financial burden in the future. Before jumping into a do it yourself floor removal home renovation, consider the expense it could cost you first. If you’re serious about removing flooring yourself, you have two options. You can either purchase the tools to keep in your collection of equipment. Or, you can find options for renting these tools. Either way, be prepared to spend money in collecting the tools required to removal flooring on your own. Additionally, consider the cost of other gear you might need besides tools. This includes safety glasses, gloves, dust masks, and boots. With do it yourself floor removal, you’re going to have a lot of debris to discard. Your flooring extends the length of the square footage in your home. Especially if you’re removing a large portion of flooring, your garbage service may not pick it up. Usually, the discarding of flooring during the removal process requires the rental of an approved dumpster. Rental prices are commonly determined by how long you need to keep the dumpster on your property. And, if you’re doing the project yourself, that may take a while. 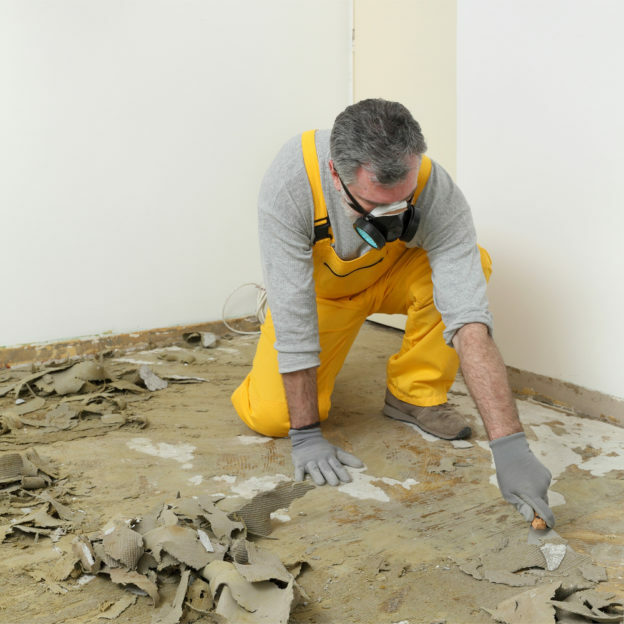 It’s understandable that you want to save money by performing your own floor removal. But, there’s a reason why floor removal companies call their employees professionals. It’s possible to come across problems in the floor removal process and, if you’re not a professional, make matters worse. Damaged subflooring or other mishaps could end up costing you a whole new bill. Last but not least, removing flooring can be a dangerous job, especially if you don’t know what you’re doing. And, medical bills don’t come cheap. So, to ensure that your safety and your spendings are on the same page, it’s best to consider professional floor removal. -Instead of having to rent or buy equipment, we bring the tools to you! We have all the equipment needed to remove any type of flooring. This includes our innovative system which removes tiling with a dust-free method. This saves you the hassle of cleaning mass amounts of dust once the project’s over. And, it means you can start on the installation process sooner. -Rather than spending the funds to rent a dumpster, we provide debris removal in the estimate of our services. We’ll provide the dumpster and get rid of your old flooring for good. Plus, you can skip the literal burden of hauling of heavy debris from your house to the trash. -With a professional service like Dustbusters, you can rest easy knowing all aspects of removing your flooring goes as planned. You won’t have to worry about spending extra funds on mishaps, emergency room visits, or other unforeseen events you may encounter attempting it alone. -Going about removing flooring yourself will undoubtedly take you some time. And, as the saying goes, “time is money”. Rather than spending your precious weekends or taking time from work, we can get your floors removed in as little as one day. This way, you can get your project done faster, and get back to work faster. Ready to see what a professional floor removal service costs? Call us to get a free, no-obligation estimate at 866-883-8783.